Crosses are extremely popular tattoos because of their deep and personal meanings, historical and cultural significance, and easily customizable design. 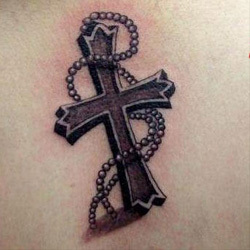 A popular design with both men and women, a cross tattoo can be placed almost anywhere on the body, either on its own or as part of a larger design. Depending on the size, design, and other elements included, the cross came come to represent a plethora of different meanings, thus making this the perfect tattoo for almost anyone! 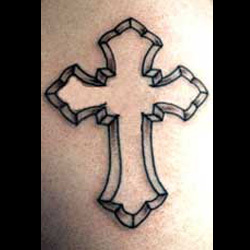 The ability to customize your cross tattoo design to suit your own beliefs and style is one of the great things about this tattoo - the variation possibilities are almost endless! While a cross on its own is a popular choice for many, the design variations below demonstrate how easily you can add other elements or customize the cross on its own to best reflect the meaning that this symbol holds for you. Perhaps the most common connotation that the cross has is of a Christian and Catholic symbol. Christianity, of which Catholicism is one variation, holds the cross in high regard as the foundation of the religion is Jesus' crucifixion and subsequent rising from the dead. The Christian/Catholic cross is often simple in its design, a simple t-shape, and can be done in any color depending on your preferences. This design is the basis for many of the variations detailed below, so feel free to work with your tattoo artist to expand on and customize the tattoo! This simple and quite feminine design is perfect for those who want a subtler reminder of their Christian faith or spirituality. Often tattooed on the inside wrist, ankle, shoulder blade, or behind the ear, the small cross shows off your beliefs to the world, but in a delicate and not overpowering way. While you may choose to design the small cross in a simple t-shape, you can also add more ornate details such as interlocking patterns, colors and jewels, or a halo on top. Ultimately, almost any of the designs detailed below can be made on a smaller scale and placed perfectly to fit your needs! 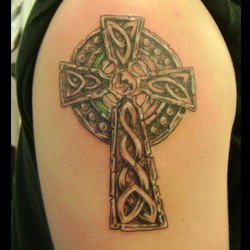 Around the world, the Celtic cross is one of the most popular designs for those looking to get cross tattoos. As both a marker of Celtic heritage and Christian faith, this design does double duty and is perfect for anyone who has an affinity for or a background in either of these identities! Celtic designs contain knot work, intricate loops, and are often done in green, gold, or black - and the Celtic cross is no exception. Such patterns add even more meaning to the Celtic cross design: the knots symbolize the link between the physical and the spiritual, while the loops represent both the cyclical and eternal nature of life. A tribal cross is a twist on the traditional cross tattoo design that incorporates the black intricate and interlocking patterns common to other tribal tattoos. This particular style is excellent for those who want their cross tattoo to indicate strength, dedication, and courage as the tribal style is known for its strong designs that immediately catch the eye. The iron cross has its roots in German history, having been used by the German military in the late 1800s: it was a symbol of bravery and was used on medals. In later years, it served more as a form of decorative symbolism in the German military. 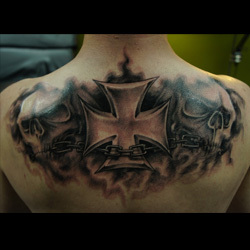 An iron cross tattoo nowadays can also have some rebellious symbolism and convey a message of nonconformity and a refusal to submit to "the man" or the "establishment". The cross itself has four equal sides, all of them flaring out on the ends, and is usually done in black or grey ink though you are free to use whatever color suits your own personality. If you want your design to focus on the darker connotations of the cross, then a Gothic design might suits your needs perfectly. The Gothic design can be done in several different ways - you may wish to have the cross look as though it is made of stone (perhaps in the vein of a gravestone or tomb), or add Gothic-style flourishes such as ornate edges, intertwined snakes or thorns, or blood-red accents on an otherwise black cross. Designed in this way, the cross comes to represent the dark nature of Goth culture, as well as harken back to the art, architecture, and literature of the Gothic movement. 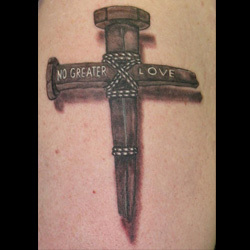 Getting a wooden cross tattoo is a clear indication to others, and a reminder to yourself, of your Christian faith. According to biblical tradition, Jesus was crucified on a wooden cross before he rose again and ascended into heaven; this cross is therefore widely used by Christians and is a popular tattoo among those most dedicated to their faith. You can choose to keep the design simple, or you can personalize it by adding touches, such as those discussed below or by including your initials or baptism date to reaffirm your dedication to your faith. Another popular cross tattoo design is that of the Maltese cross. This particular cross dates back to the Crusades and symbolizes sacrifice and courage; it is therefore a popular option for firefighters, police officers, and members of the armed forces. These men and women use it to symbolize the dedication they have for their jobs, community, and country. The cross itself is usually done in black, and instead of a straight 't' shape, each end has two points which make a 'v'-shape. 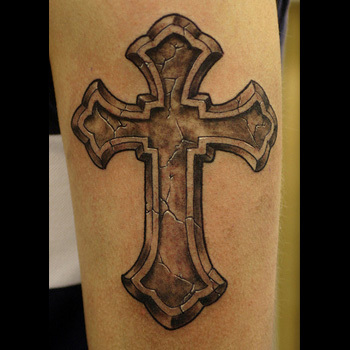 A 3D cross tattoo is great for those who want their tattoo design to have a real artistic edge to it. 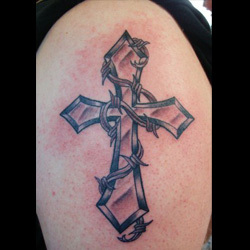 Created using beveled sides and soft curves, a 3D cross will appear slightly elevated and raised, giving the impression that it's more than just an inked tattoo: rather, it gives the appearance of a separate object that you can almost grasp with your hands. 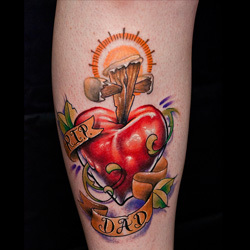 This design style can be adapted to almost any cross and will really make your tattoo pop! The inverted cross has a long basis in history and Christian tradition and is often referred to as the cross of St. Peter: this martyr was crucified upside down, because he felt that he was not worthy to die the same way that Jesus did. In such a context, the cross represents our humanity and how, although we will never attain the perfection that Jesus did, we should still strive to walk in his footsteps. But while primarily seen as a symbol of Christianity, more recently the inverted cross has been used to symbolize atheism and the occult. For instance, several black metal bands utilize inverted crosses in order highlight their supposed devotion to Satan. Depending on your interpretation of the inverted cross, you should work with your tattoo artist to design your tattoo accordingly. If you want the cross to symbolize your Christianity, you may want to keep the design simple (such as a wooden cross) but if you want to connote Satanism and the occult, you may wish to design the inverted cross in a more Gothic style. The nail cross tattoo is a very powerful and moving way to convey your Christian beliefs and spirituality: Jesus was nailed to the cross so the combination of these two symbols - a cross made out of two nails - becomes doubly significant. There are several ways to make this design your own. The first way is to decide what type of nails you want to use. Many choose to use the old-fashioned, rudimentary nails that would've been used in Jesus' own time, but if you are a carpenter, mechanic, or someone else who works with tools in their everyday life, you may wish to use a more modern nail. Another way to personalize this tattoo is to decide what material will hold the nails together in the design - you may choose from barbed wire, thatched rope, or simply nothing at all. One interesting design element you may want to include is the effect of the nail going through your skin and out again, demonstrating your solidarity with Jesus and your desire to join in his suffering. To make this design even more personal and significant, include your favorite bible verse along the cross, either the full verse or its biblical notation. You can also include a date or person's name that holds significance to you, perhaps in memory of their death. The Latin cross is another cross design that symbolizes Christian faith. 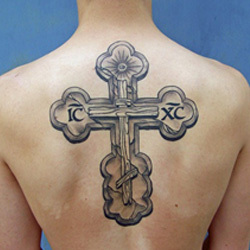 A Latin cross tattoo is simple yet can be made to be quite ornate and beautiful: normally composed of a plain long vertical line and a smaller plain horizontal line that intersects it approximately a third of the way down, the ends of these beams can also be curved or include a knotted design. The vertical beam of the cross represents the divine, the horizontal beam represents the world, and the intersection of the two beams is the union of divine and world. These cross tattoos are often relatively small, and while they are usually done in black or grey scale ink, you can choose to have accents or the entire cross in color. 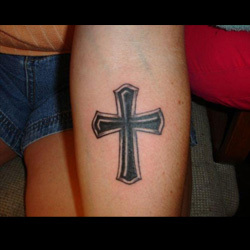 Because of their small design, this is a popular cross tattoo for women, who often have them inked on their the wrists, hands, ankles, and upper arms. Egyptian crosses are a particularly popular choice among women. Also known as ankhs, this small design is considered to be a symbol of life, hence its popularity with women. The ankh can also represent the union of the masculine and the feminine, which has inspired many couples over the years to get identical Egyptian crosses on their bodies. 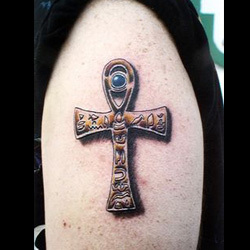 The ankh can also be used to demonstrate respect for ancient Egyptian wisdom and culture, thus making it a perfect tattoo for anyone of Egyptian heritage or who has an affinity with Egyptian culture. Another cross design you may want to consider is that of the Tau cross, which is also known as St. Anthony's cross because of its affiliation with that saint (he is often depicted with a Tau cross in art). The Tau Cross is T-shaped, and thus named after the Greek letter it resembles, and is an ancient symbol of eternal life. For your tattoo design, you should keep the traditional T-shape, with the horizontal beam lying directly on top of the vertical beam, but you can play with the curve and design of the beams themselves. You may also wish to include a reference to St. Anthony - perhaps a quote or even the saint himself - in your design to further personalize the tattoo. Though to many people the two are interchangeable, the crucifix and cross are different in that the crucifix actually has Jesus' body on it. 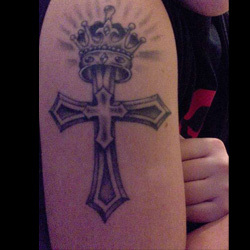 This tattoo design, therefore, has overt Christian symbolism and clearly references one's devotion to one's faith. 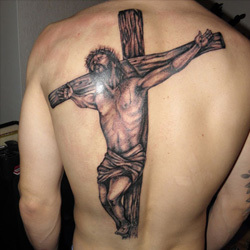 A crucifix tattoo, therefore, should have the body of Jesus on it, but you can personalize the tattoo through several different means: you can choose between color and grey scale, represent Jesus in various different ways according to preference or a specific artistic reference, and include a particular bible quote that has personal meaning for you. Though you can place this tattoo on a small part of the body, such as inside the write or on the nape of the neck, it looks best when done as a more large scale design, such as across the back or covering the upper arm. Different from the Latin and St. Anthony's cross in its beam placement, with the horizontal beam exactly halfway down the vertical beam, the Greek cross is primarily used by Greek Christians, but it has its origins in pre-Christian times: the Assyrians used this cross to represent the heavens, and it has been associated with sun-worship throughout history. The equal placement of the beams has also led to this design being known as the equilateral cross. Though the basic form is quite simple, there are several different ways to make this design your own. One interesting design to consider is to have four smaller Greek crosses in the quadrants made by the larger Greek cross. Another idea, perfect if you are of Greek origin or have an affinity for Greek culture, is to include a saying or person's name in Greek under or around the cross in order to import a more personal meaning. 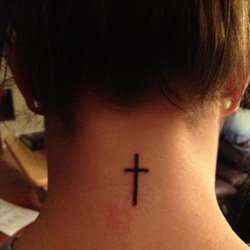 These tattoos can be quite small, making it perfect for an inconspicuous place such as behind the ear or on the foot or ankle, but you can also enlarge the cross so that it goes across your back or on a shoulder. Perhaps most well known today as being the cross featured on the Scottish flag, the St. Andrew's cross is shaped like an "X" with equal-length beams intersecting at their centers. The cross is named for St. Andrew who was crucified on such a cross, as he did not deem himself worthy to be killed on a cross identical to the one on which Jesus was crucified. 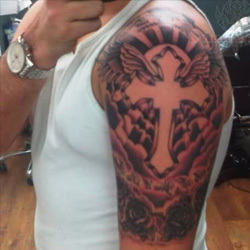 Your St. Andrew's cross tattoo design can include several personal and unique elements. If you are of Scottish heritage or have a love for Scotland and its culture, consider getting the cross as depicted on the Scottish flag: white against a blue background. 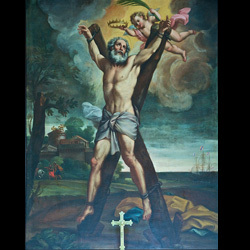 If you'd rather have your cross in black or grey scale, you can personalize the design by including a bible quote or other message of Christian faith, or include St. Andrew himself in the design, perhaps as carrying his cross towards his crucifixion to demonstrate your solidarity with the saint. 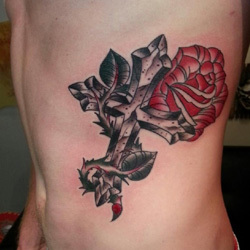 Adding a rose to your cross tattoo design is a beautiful, and often poignant, way to personalize your tattoo. First, you must carefully choose the cross that you want as a part of this design: some, such as the Gothic cross, are representative of death and darkness, while others, such as the wooden cross are clear indicators of Christian faith and spirituality. Depending on the cross that you've chosen for your design, the rose can serve many different meanings. Around a Gothic cross, the rose is another layer of dark meaning, particularly if it's a thorny rose: love has caused suffering or perhaps even death, or the seduction of an individual or other desire has led to destruction. On other crosses, the rose can serve as a symbol of the twinning of suffering and desire, or of a love that we must bear. The two symbols together thus create a powerful representation of balance: sometimes we must suffer when we love. 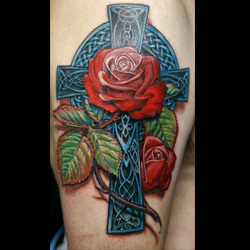 This tattoo is most vibrant and eye-catching when done in color, especially with the red of the rose standing out against a black or brown cross, but the symbols are equally powerful when done in grey scale. 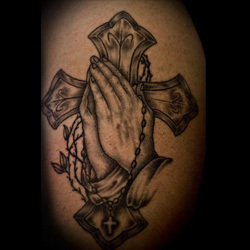 Another cross tattoo design to consider, especially if you're of Christian faith, is to have the cross coupled with praying hands, which can either be below, centered with, or holding the cross. This design is easy to personalize, as you first have several different cross designs, many of which are detailed in this article, to choose from! You can also include a bible quote or other inspirational saying (such as "Only God Can Judge Me") around or below the cross and hands to further personalize the design and make it unique to you. Working carefully with your tattoo artist, you can also choose to include other important spiritual elements, such as rosary beads or clouds and sunbeams in the background, to make the design your own. While almost always done in grey scale, you can also choose to have the cross in color and the hands outlined in black - your own flesh color works for the color of the hands, which then clearly indicates you are the one praying. A cross with a heart is a beautiful and meaningful tattoo for anyone to consider, though this design is most popular with women. A cross coupled with a heart can demonstrate a coupling of love and faith, or as a symbol of remembrance of someone you love who has passed away. There are several different design options for this tattoo, all of which can be further personalized depending on your own style and the symbolic significance you wish to the design to impart. One design that is particularly feminine and delicate is to have an outline of a heart, either plain or stylized with curves and/or spirals at the bottom tip, around the cross, which can also just be outlined. This looks elegant when done in black but you can personalize the design by adding color to either the heart, cross, or both. Similar to this, another delicate design is two overlapping hearts with the overlap in the shape of a cross - you can make this clear by having the hearts done in red ink and the cross done in black ink. This particular cross design is of the constellation of the Southern Cross, which is also featured on the Australian flag. A Southern Cross tattoo, therefore, is perfect for anyone with Australian heritage or who has an affinity for astronomy and the skies above. There are a few different options for this design. If you want to make your Australian heritage and/or love for Australian culture clear, you may wish to have the entire flag tattooed, perhaps over your heart to clearly demonstrate your love for Australia. If you prefer to just get the constellation tattooed, whether as a sign of heritage or a love for astronomy, you can choose to either get outlines of the stars, perhaps in black or golden yellow, or to have the stars filled in completely with the color of your choosing. This design can be easily adapted to any place you wish to put it, making it a great choice for either a small and delicate tattoo on the wrist or a full-back piece. Getting a cross with wings, angel or otherwise, is a wonderful way to demonstrate remembrance for one lost. The cross with wings can also symbolize that Jesus rose from the dead and is now in heaven, looking down on you. In either scenario, you have several options for personalizing the design. You can first choose from an array of different cross designs, such as the ones discussed here, and then decide whether you want to have angel wings or the wings of another animal, such as a bird or butterfly (further discussed below), that was the favorite animal of your loved one. If the wings are of an angel, you can also add a background of clouds or top the cross with a halo to further signify the place that individual now has in heaven. This design can be personalized even more by adding a memorable quote or date related to the individual you lost, or simply a bible quote that is significant to you. While often done in grey scale because of the complexity of the design, you may also choose to get the tattoo inked in color. Finally, this tattoo is easily adjusted to fit almost anywhere on the body - so be sure to work carefully with your tattoo artist to find the design and placement that's right for you! If you want to remember a loved one but don't want the size or additional elements of cross with angel wings design, consider getting an RIP cross. Often done using a Latin, Greek, or Gothic cross, you can also choose a different cross shape - whatever suits your own design and symbolic needs! For the RIP portion of the design, you can choose to have either RIP or "Rest in Peace" written on the cross itself or on a banner/ribbon on or going around the cross. You can also write the individual's name and/or the date the passed away on the banner, giving yourself a constant visible reminder of the person you lost. 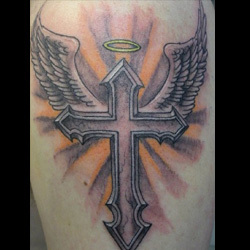 With this tattoo, you can also choose from color or grey scale in your design - those getting a simple or small RIP cross may wish to have their tattoo done in color, while those getting a more intricate design may choose to have the tattoo inked in blacks and greys in order to emphasize the content rather than the form. Another excellent way to remember a loved one and/or express your religious faith using a cross tattoo is to include a halo in the design. Sometimes this design also includes angel wings, but the choice is up to you! One possible halo and cross design is to include rays of light and/or clouds in the background, to further symbolize that your loved one or guardian angel is watching over you in heaven. Another design option, perfect for anyone of Irish heritage, combines a few different Celtic images: a Celtic cross surrounded by a Claddagh ring, which resembles a halo - especially when the ring is done in a beautiful gold color! To personalize the design, include the name of the person you lost, or the date on which they passed away. You can also add a quote such as "Gone But Not Forgotten" to serve as another daily reminder of their spiritual presence as you walk through life. Pairing your cross tattoo with a dove is a beautiful way to promote peace. The dove is a universal symbol for peace and tranquility, and adding it to the cross creates a doubly significant representation of peace through faith. 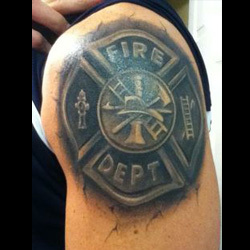 There are a few different designs you can choose from with this tattoo, all of them equally symbolic and customizable. Most often, this design features a Greek or Latin cross, but using a Gothic cross would create an interesting juxtaposition between peace and death/darkness. While often done in grey scale, this design also looks beautiful when done in full color. In addition to customizing the cross, you can also customize the dove. 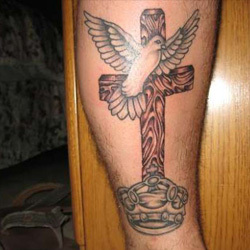 For instance, you could have the dove perched on a beam of the cross or have it flying across, above, or behind it. Another design option, and one which would further promote the idea of peace, would be to have the dove holding an olive branch in its mouth, just like the dove that returned to Noah after the great flood. Finally, to symbolize world peace, you may want to include the earth in the background or below your cross and dove. This cross design, a combination of a cross and an anchor, symbolizes hope and faith, and the ability that faith has to ground you. 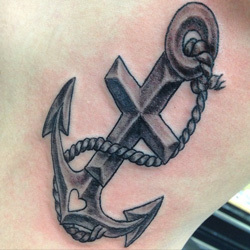 The anchor and cross tattoo can be designed in a number of ways according to your personal preferences and the meaning you wish the tattoo to impart. Usually, it is the Latin cross that is part of the anchor tattoo, as in a real anchor, but the design would also work with a Greek or Egyptian/ankh cross. Another option is to have a cross of your choosing above a wave that is curved to resemble the bottom of an anchor. If you really want to emphasize your faith, you can make the cross element of the anchor into a crucifix with Jesus' body on it; including a ship's steering wheel in the background can demonstrate how Jesus and your faith steer you in everyday life. A butterfly typically represents rebirth and renewal, and coupling this image with a cross creates a doubly significant symbol. 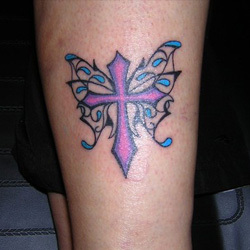 A butterfly and cross tattoo can be designed in a few different ways, and done in whatever color scheme you choose - though opting for vibrant colors and bold patterns on the wings further emphasizes the renewed life that comes when a butterfly emerges from the cocoon and Jesus rises from his death. Most often, this tattoo has butterfly wings on either side of the cross - be it Latin, Greek, Gothic, or any other cross of your choosing! These wings can be as plain or as intricate as you like, and can be patterned after a real species of butterfly or a design of your creation. Another option is to have a small butterfly sitting atop the cross. This can represent a loved one you have lost and who is now with Christ in heaven, or even a symbol of your own rebirth in faith. A cross depicted with or encircled by rosary beads is an excellent and unique way to represent the Christian, and particularly Catholic, faith. A cross with a rosary chain serves as a double representation of your beliefs: the cross serves as a representation of Jesus, while the rosary beads are often associated with his mother, the Virgin Mary. This prayer chain is used by devout Christians to meditate on their prayers, and is symbolic of a deep and personal faith in God. For this tattoo, you can choose from a couple different formats. You may wish to simply focus on the cross or crucifix that is at the end of the rosary chain, or have a rosary chain encircling a cross of your choosing. 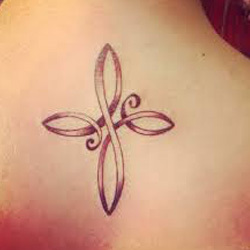 Either design symbolizes the same dedication to faith and prayer! One option that is especially appealing to women is to have the rosary chain encircle the ankle or wrist, almost as a bracelet or anklet would. As with larger rosary and cross tattoos, which may be placed on a shoulder or even the entire back, this delicate and feminine placement can be done in any color or in grey scale. Combining a cross with a crown in a tattoo can have a few different meanings, depending on your own understanding of the symbol. Often, the cross and crown are used as a unique way to demonstrate your Christian beliefs, clearly stating that God is your king and ruler. But it can also be used to signify that you have come out on top of your own struggles (thus 'ruling' them) or that you have lost an important role model who was 'like royalty' to you. Several different design options are possible, depending on the type of cross and crown that you choose. For some of the simpler cross designs, such as the Greek cross or wooden cross, you may want to choose an equally humble crown to match - perhaps a simple gold or bronze with a few detailed points. If you're choosing a Gothic or ornate Latin cross, however, you may want to opt for a more intricate crown bedecked with jewels. If the cross and crown represent a loved one you have lost or the personal struggles you have overcome, you can include that person or your own name, or even an inspirational quote either below or on a banner going across the crown. This equally serene and spiritual tattoo is a wonderful way to signify your faith or remember a loved one who has passed away. A cross with clouds tattoo can feature the cross with a single cloud in the background or a sea of clouds; in either scenario, the cloud(s) is often representative of God and the heavens. You can also choose to include sunbeams in the design, indicative of God's light shining down on you and/or his presence with your loved one in heaven. Because of the potential intricacies of this design and the predominance of white in clouds, often such cross and cloud tattoos are done in grey scale. You can, however, choose to have the cross (in whatever design you like!) done in color - this is particularly moving if you choose to have a wooden cross done, as this clearly symbolizes Jesus and his suffering and crucifixion on the cross. 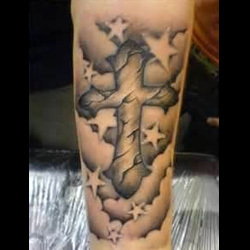 Including a star or stars with your cross tattoo is a great way to add depth to an already symbolic tattoo, and the tattoo design can vary based on the meaning you wish to impart. First of all, you should choose which cross works best for you - be it wooden, nail, or any of the other crosses discussed above - as that will determine some of the meaning of your tattoo (wooden and nail crosses are often religious symbols, whereas Gothic crosses impart a darker meaning). The next design options will come with the stars: often stars can stand for deceased loved ones who are looking down on us, but they can also stand for accomplishments or challenges overcome. 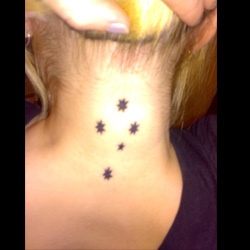 The stars can be beside, above, or encircling the cross, and the color scheme is entirely up to you - golden yellow stars truly stand out, but if the rest of your tattoo is in grey scale you may also want to keep the stars in that color scheme as well. If you want to highlight the religious nature of the tattoo, you could include twelve stars encircling the top of the cross, each standing for one of the twelve apostles. Many causes have different colored ribbons that represent their issue: for instance, a pink ribbon denotes breast cancer awareness, a red ribbon represents AIDS, and a yellow ribbon aims to raise awareness about youth/teen suicide. 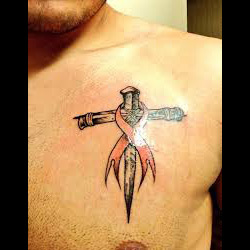 Including one of these colored ribbons with your cross tattoo, either encircling the whole cross or around the joined beams, can indicate either your personal commitment to one of these causes, or that you have lost a loved one through breast cancer, AIDS, or suicide. 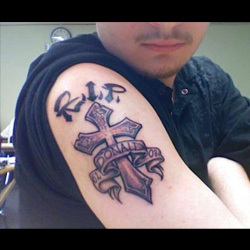 To further personalize this tattoo, include the name of the person you lost, or include an inspirational or memorable quote underneath the cross and ribbon. 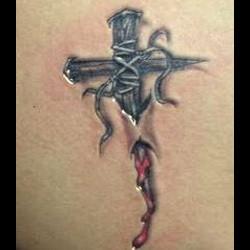 Incorporating barbed wire into your cross tattoo is another great way to personalize a cross design. A barbed wire cross is symbolic of one's Christian faith, especially as the barbed wire can represent the crown of thorns worn by Jesus as he carried the cross to his crucifixion, but it can also convey a more general sense of suffering and pain. 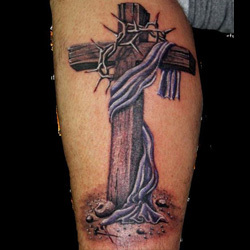 There are a couple of different ways to incorporate the barbed wire into your cross tattoo design. The first is to make the cross out of barbed wire, with the beams of wire wrapped around each other as barbed wire would twist around itself. For this design choice, a black or grey scale color scheme is best, as it truly brings out the stark nature of the design. Another way to incorporate barbed wire into your cross tattoo is to have the wire encircling a cross of your choosing (though usually this looks best with a wooden cross). You can also have the barbs done in the style of thorns, such as the crown of thorns that Jesus wore on his head: you can either place a crown of thorns around the cross, or have thorns encircling the entire cross. This type of tattoo design can be a symbolic representation of Jesus on the cross, or demonstrate the suffering you have endured for your faith or beliefs. 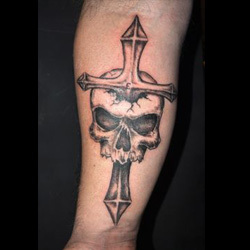 There are several ways to design your cross and skull tattoo, and working closely with your tattoo artist can ensure that you find a design that clearly embodies the meaning you wish to impart. While a skull is almost always depicted as a symbol of death, the cross can be both a symbol of renewal/resurrection and of death - your tattoo can therefore be either a doubly macabre design or a unique juxtaposition of death and renewal. 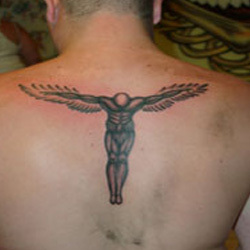 When designing your skull and cross tattoo, you may wish to have the open mouth of the skull engulfing the cross - perhaps as a sign that you are negating the possibility of rebirth and renewal; you have either turned our back on your faith, or you do not see yourself as worthy of joining Jesus in heaven. Another design option is to have the cross inside the skull with the ends of its beams emanating from eye sockets, mouth, and top of the skull. Another interesting design twist would be to have a skull above a St. Andrew's cross, thus resembling the skull and crossbones design of many pirate flags. Because so many individual design decisions go into choosing both the skull and cross elements, this tattoo is incredibly customizable. You may want to stick with a grey scale color scheme, or you may opt for a more vibrant and bold set of colors - perhaps doing the skull in the vein of Mexican sugar skulls or with ghoulish red eye sockets if you're ascribing a darker meaning to your tattoo. Combining your cross tattoo with a flower (or flowers!) is a great way to signify the delicate nature of your strength, or to clearly juxtapose the gentle and strong qualities of your personality. In general, the cross is a symbol of strength and the ability to carry a heavy burden, while the flower indicates a gentleness of spirit and the renewal of life. There are several different ways to design this tattoo. First, decide on the type of cross you want. For those with a darker nature, you may want to have several red roses surrounding a Gothic cross: the combination of blood red roses and dark, intricate patterning on the cross creates a fantastically eerie feel. But a cross and flower tattoo can also be an excellent way of remembering a loved one: by placing that individual's favorite flower at the foot of or entwined with a wooden cross, you can create a constant reminder of their presence. A cross with a lotus flower is a particularly potent combination of symbols. The lotus flower on its own is a representation of purity, the piousness of the soul, and the beginning of life or reincarnation. Coupled with a cross, a symbol of deep faith and the sacrifice that was made so that we may be born again, the image becomes all the more powerful. For your design, you may want to have a single lotus flower in the center or at the foot of the cross, or a wreath of lotus flowers encircle the entire cross. Any color scheme can be used with this tattoo, but flowers look especially wonderful and eye-catching when done in their natural colors. Set against a dark cross, whether a naturalistic wooden-colored one or a simple grey scale palate, the floral element of the tattoo will really pop. 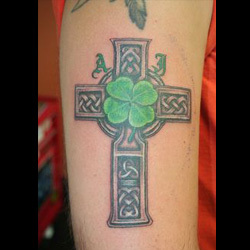 Including a shamrock in your cross tattoo is a great way to show off your Irish heritage, and to add another layer of religious symbolism to your tattoo. St. Patrick, the patron saint of Ireland, used the shamrock and its three leaves to explain the mystery of the trinity to the then-pagan people of Ireland. 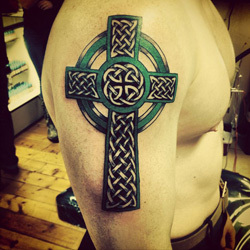 Often, a Celtic cross is used when combining a cross and shamrock tattoo, but you can ultimately choose whatever cross suits your own personal and design needs. One design option is to have interlocking patterns of the Celtic cross mirrored in the shamrock through an intricate interlocking pattern of its own. You can also choose to have a shamrock placed at the center of your Celtic (or other!) cross, or to have a field of shamrocks sitting at the base of the cross. In terms of color, you may wish to have the shamrock be a vibrant green against a black or grey scale cross in order for that element of the tattoo to stand out. You could also have the cross done in greens and golds as well as the shamrock, or you could have the shamrock done in green, white, and orange (the colors of the Irish flag) - the choice is yours! The infinity symbol has long been a popular tattoo, but getting an infinity cross tattoo puts a unique spin on this symbol, and demonstrates the everlasting nature of your faith. The infinity cross is made up of two interlocking infinity symbol, but this is the only rule when it comes to design - otherwise, you are free to personalize the tattoo in any way! You may wish to put a bible verse underneath the cross, or simple words such as "hope" or "faith" that clearly distill your everlasting beliefs. While this design is often done in plain black ink, you are free to make the cross any color you like depending on your tastes and preferences. The small and delicate nature of this design make it a favorite among women, and it is also popular for couples who wish to get matching tattoos that symbolize their love. A clear demonstration of both power and Celtic heritage, the dragon and cross tattoo features a dragon with its tail in its mouth, a symbol for the sacred circle of life and the ultimate emblem of power. Within this one tattoo are two Celtic symbols: the dragon, a symbol of power, wisdom, and prophecy; and the Celtic cross, a symbol the four elements of nature (earth, wind, fire, and water). For this design, the Celtic cross is a key element but you are free to experiment with other cross designs - it's your design and your body! 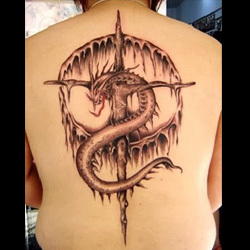 When designing the tattoo with your tattoo artist, you may want the dragon to fully encircle the cross as in the traditional style, but you can also have the dragon perched on the cross, a dragon climbing on the cross with its tail encircling the base, or have dragon wings emanating from the cross. The colors and features of dragon are completely reliant on your own interpretation - you can keep it a mythical green, play around with vibrant blues and purples, or simply have the design done in grey scale. 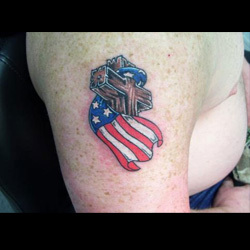 Having a cross and flag tattoo is a unique way to demonstrate your patriotism, as well as your faith, and even commemorate a love one who has passed away. This tattoo is great for whatever country's flag you wish to include in your design, and there are a few different ways to combine the separate flag and cross elements. Often a simple cross design, such as the wooden cross, is best in order to highlight the flag's design and colors. When combining cross and flag, there are a few different options: the flag can be draped across the horizontal beam, be the backdrop to the cross, or even color the cross itself as an internal design within the outline of the cross. While often a combination of faith and patriotism, this tattoo is also great for memorializing a friend or family member lost in battle. If this is the case, you may wish to include their name or a memorable quote to personalize this tattoo even further. Any lovers of basketball may want to consider a tattoo to commemorate their favorite sport and the strength and dedication it requires. 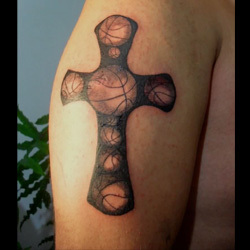 A basketball and cross tattoo is a great way to demonstrate your love for the game. One popular design choice is to have the bottom of the cross thrusting through a basketball, wit a quote such as "Only the Strong Survive" as a bold statement underneath. You can also choose to have a basketball at the center of the cross to demonstrate its centrality to your life. Often a simple cross, such as a wooden cross, works best with this design, but there are no rules when it comes to tattoos - so choose whatever works best for you! Fire often serves as a symbol of cleansing and purification, so combining a cross with flames in your tattoo is a doubly potent image. The potential for personalization is high with this tattoo: you can choose from any cross design you like, with a Gothic cross imparting a darker message and a wooden cross implying more spiritual connotations. The flames can be at the base of the cross, thus demonstrating how you can rise above any challenge, or they may be the backdrop, demonstrating the potential for hell and damnation that all humans face. 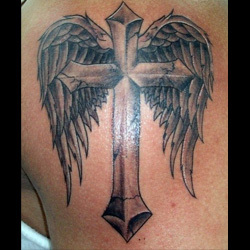 Another option in this design is to have wings on the cross to symbolize your hopes for heaven or the presence of your guardian angel, guiding you away from temptation. 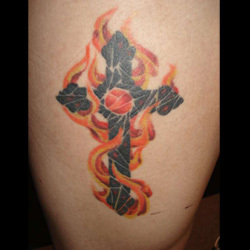 Though this design can be somewhat complex, consider having at least the flames in color - your tattoo will truly pop! Cross tattoos are an excellent choice for men and women, and while often associated with Christianity, the cross symbol dates back to pre-Christian times and has several meanings beyond Christian symbolism. The ability to adapt the size of the cross to either a large-scale, full back piece all the way down to a small design that fits behind the ear makes this a fantastic design if you want to be able to personalize a tattoo to suit your exact needs and style. 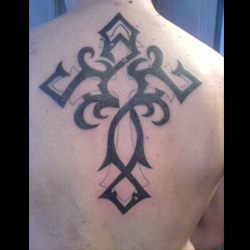 For custom design of a Cross, you can check our Custom Tattoo Page.